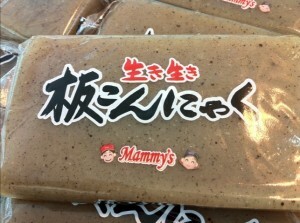 Konnyaku is made from the root of Konjac, a kind of yam type vegetable. An extremely hard jelly, you have to chew for a long time to penetrate it. Because of this Konnyaku snacks have actually been banned in the United States and EU and 13 people choked and died eating Konnyaku candies in Japan between 1995 and 2008. However, it is still eaten regularly here and can be found in almost every bento box or odon stand. Many people eat it as a diet food because it is high in dietary fiber, low in fat and believed to clean out your intestines. Personally I neither hate nor love it. 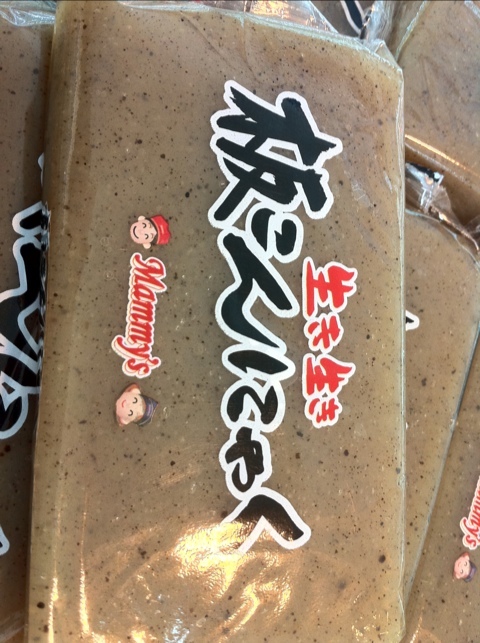 It is tasteless, chewy and usually skipped when I find it in my lunch box!